Liberton Christian School’s founders settled on its name in 1981. A vision of several Christian schools for the city was foreseen, and to include ‘Dunedin’ in the School’s name was viewed as unnecessarily restrictive. Liberton is a small suburb of Dunedin. Together with neighbouring Pine Heights and Dalmore, these suburbs are usually referred to collectively as Pine Hill. Liberton’s obscurity is confirmed by occasional correspondence addressed toLiberation or Liberty Christian School. The name Liberton has its origin in Edinburgh, Scotland, the former home of Dunedin’s founding settlers. Dunedin is the old Gaelic name for Edinburgh and, as the place somehow reminded Dunedin’s pioneers of the Midlothian countryside from which the majority came, many street and district names were transplanted from the mother city. This closeness was later cemented by the establishment of a sister city relationship between the two. The surnames Libertune and Libbertoun have been known since the eleventh century. After the Norman invasion of 1066, the de Libbertoun family were instrumental in settling a Liberton village which, as a place name, was first recorded in 1128. Derived from the Anglian hlida beretun, the name literally means “barley farm at the slope”. A suggestion that the name is a corruption of Lepertown has been disproved. Another dubious theory attributes the name to the emblem of the families of Liberton—the leopard’s head—in heraldic terms the ‘libard’. 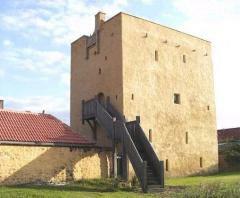 The village’s most notable landmark is undoubtedly Liberton Tower, dating from the late 15th century. 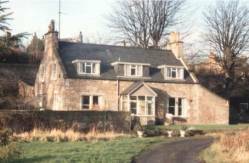 Built as a family dwelling by the Dalmahoys, it changed hands twice before being abandoned in the early 1600s, serving in times following as a farm store, byre and piggery. Recently restored, Liberton Tower may now be hired for functions and accommodation. A fictional “Laird of Liberton” was supposed to have resided in the tower according to Sir Walter Scott’s 1818 novel, Heart of Midlothian. There’s also Liberton Bank House in which Sir Arthur Conan Doyle lodged in the 1860s while attending school in Edinburgh. Conan Doyle is best known as the creator of the fictional detective, Sherlock Holmes. Liberton Bank House is the last surviving Edinburgh boyhood residence of Conan Doyle. Recent plans by the McDonald’s fast food chain to demolish the house to make way for a restaurant were refused by local authorities. Since the nineteenth century, Liberton has lain within the precincts of greater Edinburgh (see the star on map above). The photograph at left, taken circa 1890, shows Liberton Kirk as viewed from Liberton Drive. The kirk is located at the locality’s crossroads, where Liberton Drive and Kirkgate intersect Liberton Brae. 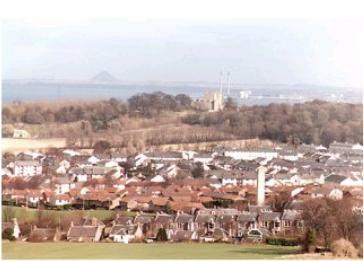 Its environs are known as Kirk Liberton, one of the parish’s four districts. The other districts are Over Liberton, Nether Liberton and Liberton Dams. Two schools, Liberton Primary and Liberton High School, share the Liberton name with us. The primary school has eighteen classes compared to our four. The high school was opened in 1959 by HRH The Duchess of Kent and caters for more than nine hundred students. Interestingly, its newsletter is also called Liberton Link. Other institutions include Liberton Community Council, Liberton Medical Group and the inevitable Liberton Golf Club. Meanwhile, the school in Dunedin is gaining some traction over the Liberton name as a Google search on ‘Liberton’ will attest.